Dutch voters on Wednesday (20 March) head to provincial polls billed as a referendum on Prime Minister Mark Rutte’s policies, after a campaign overshadowed by a possible terror attack on a tram. Right-wing parties pushed the issue of integration back into the foreground as the country reeled from Monday’s shooting in the city of Utrecht for which a Turkish-born man has been arrested. 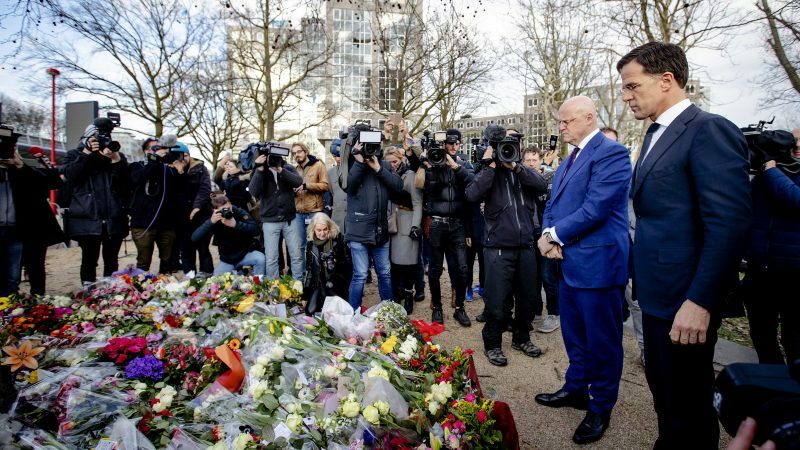 Following the Utrecht attack, almost all political parties halted campaigning for the elections — which are for provincial bodies but determine the composition of the Dutch senate or upper house of parliament. Only the populist, anti-EU Forum for Democracy (FvD), led by Thierry Baudet, continued with a rally in the Hague’s seaside suburb of Scheveningen, drawing sharp criticism from lawmakers. Polls show centre-right premier Rutte’s four-party coalition — which currently carries a slender one-seat senate majority — is headed for major losses when the senate seats are decided. The head of Dutch socialist party has called the vote a “Rutte referendum”, although Rutte has said he will not step down if his coalition loses its majority and therefore needs help to drive through laws. Dutch newspapers predicted that GroenLinks — the leftist ecological party led by Jesse Klaver, a politician best known abroad for his strong resemblance to Canadian Prime Minister Justin Trudeau — was set to make gains and become a potential senate kingmaker. Meanwhile, Baudet’s party could threaten the anti-Islam Freedom Party of bleached blonde far-right leader Geert Wilders, which has traditionally attracted hardliners in the Netherlands. Voters can elect some 570 representatives to the country’s 12 provinces, who will in turn decide on May 27 who sits in the 75-seat Dutch upper house. Polls say Rutte’s coalition partners — D66 and the Christian Democrats (CDA) — could drop as much as 10 seats. Losing the majority will see the coalition lead by Rutte’s centre-right VVD party having to find other opposition partners to get laws passed, opening the door to potential king-maker roles. Turnout for provincial polls is traditionally low, standing at 56% in 2011 and almost 48% in 2015 as opposed to national elections in 2017, with a turnout of 82%. It is pretty disgusting that FvD is referenced via a tweet of an lunatic antifa troll account dedicated to trashing the party. Where is the EU action against fake news when you need it? Isn’t this supposed to be in informative site? instead of a propaganda site for the ruling parties? Stopping migration and Islam is not fascism but actually protecting an open and free society. Acknowledging biological differences between men and women isn’t sexism, it’s science, truth and freedom of speech. Johan, please carefully take in these comments on your rather wild statements, First, you do not have to “stop migration”, because it is a natural phenomenon. You simply apply the existing rules on migration and asylum, which are pretty restrictive anyway (but people like you prefer to claim that everyone is welcomed in at all times). Moreover, you cannot and do not have to “stop Islam”. There is a freedom of religion in most civilised countries. If you want to benefit from that as a Christian, you cannot deny it to other denominations (unless you want to succumb to fascism yourself). Lastly, everyone is free to acknowledge biological differences between men and women, and no-one calls that sexism. What you should not do is make those differences absolute, pretend that everyone is required to fit into one precise group forever, and hide behind “freedom of speech” arguments to defend a narrow-minded, conservative, bigoted world view that we thankfully left behind us in the 1950s.